HONOLULU (20 March 2019) At 9:40 a.m. yesterday, minutes after Kitty M. Simonds completed the executive director’s report to the Western Pacific Regional Fishery Management Council, the Hawai’i-based fishery was closed due to the fishery’s interaction with a 17th loggerhead turtle this year. The Hawai’i-based shallow-set longline fishery for swordfish has a federal observer on every vessel for every trip. The North Pacific loggerhead population is growing annually at 2.4 percent, but a court settlement in May 2018 reduced the fishery’s allowable interaction with the species from 34 to 17. 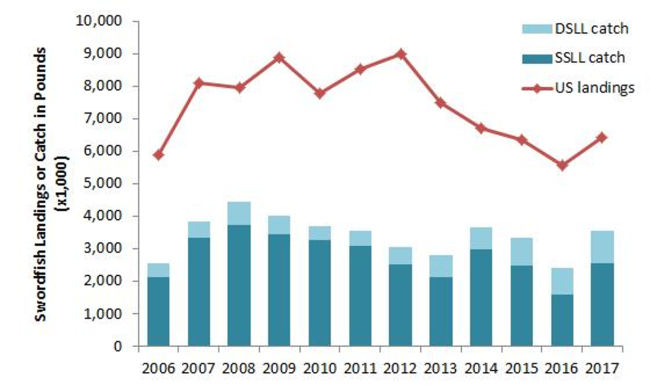 The interaction cap of 17 cannot be modified until the National Marine Fisheries Service (NMFS) completes a new biological opinion (BiOp) for the fishery. Upon hearing the news of the shutdown, Roger Dang, whose family has fished with longline vessels out of Hawai’i for more than 30 years, immediately sent a message to the Council. Council member Michael Goto read the statement to the Council. The Hawai’i longline fishery provides between 50 and 60 percent of the domestic production of swordfish in the United States. The North Pacific swordfish stock is healthy and is not overfished or experiencing overfishing. About 94 percent of the seafood consumed in the nation is imported. Besides the new BiOp for the Hawai’i shallow-set longline fishery, the Council is waiting for the agency to develop new BiOps on the Hawai’i deep-water longline fishery for bigeye tuna, American Samoa longline fishery for albacore and the US tropical purse-seine fishery for skipjack tuna in regards to oceanic white tip shark. NMFS listed this shark as threatened under the ESA in January 2018. Ramifications from a delayed BiOp for the American Samoa fishery could be “catastrophic” for the Territory, said Council Chair Archie Soliai. The fishery provides the StarKist Samoa cannery, the Territory’s largest private-sector employer, with MSC-certified albacore tuna needed for its Blue Harbor label and US fish needed for certain government contracts, such as school lunch programs and military MREs (meals ready to eat). “The fishery needs support in order to sustain operations and maintain jobs,” Soliai added. Council Vice Chair Christinna Lutu-Sanchez said that fishery participants have been hopeful that the Council’s recommendation that a portion of the American Samoa Large Vessel Prohibited Area (LVPA) be opened to the American Samoa longline vessels would help the fishery with economic struggles it has experienced in recent years. Those struggles have caused fishery participation and catch to plummet to the point that the fishery is on the brink of disappearing. The LVPA amendment, which intends to bring relief to the fishery, cannot move forward until the BiOp is completed. 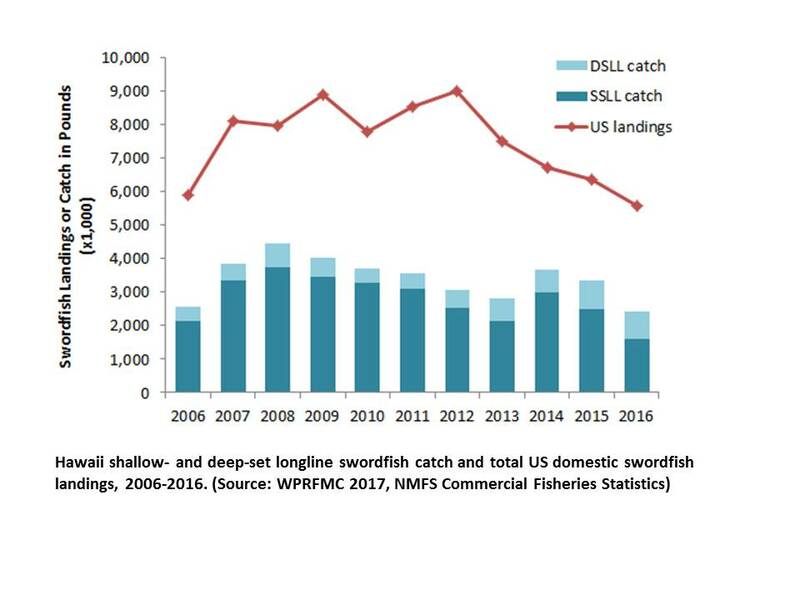 In addition, in January 2018 the Hawai’i deep-set longline fishery was shut out of the 132,000 square mile area known as the Southern Exclusion Zone (SEZ), which leaves less than 18 percent of the US exclusive economic zone (EEZ) around Hawai’i open to the fishery. That closure was triggered when that fishery had a second interaction with a false killer whale that NMFS considered would result in mortality and serious injury (M&SI). If a false killer whale is released alive with any fishing gear, regardless of the length, NMFS in most cases considers the interaction to be a serious injury. 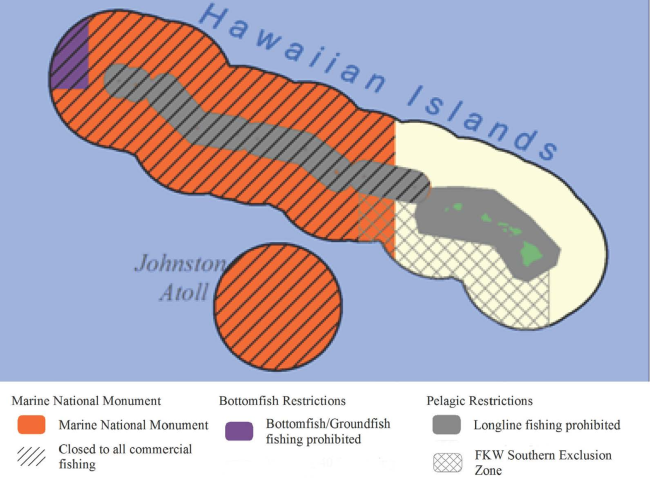 Besides the SEZ, fisheries are banned from the 582,578 square miles of US waters comprising the marine national monument in Northwestern Hawaiian Islands. Longlining is also prohibited within 50 to 75 nautical miles of the main Hawaiian Islands, based on regulations developed by the Council in the 1990s. The Scientific and Statistical Committee (SSC) that advises the Council, last week, asked that NMFS develop serious-injury determination criteria for false killer whales that are probability-based. The SEZ may reopen in 2020 if the average estimated false killer whale M&SI in the deep-set longline fishery within the remaining open areas of the EEZ around Hawai’i for up to the five most recent years is below the potential biological removal (PBR) for the species. The PBR is defined by the Marine Mammal Protection Act as the maximum number of animals that can be removed, not including natural mortalities, from a marine mammal stock while allowing that stock to reach and maintain its optimum sustainable population, i.e., its maximum productivity keeping in mind the carrying capacity of the habitat and health of the ecosystem. The SSC recommended that the Council request NMFS develop approaches to incorporate population viability analysis (PVA) to supplement the use of PBR and to reduce uncertainty in PBR estimates. PVA is a species-specific risk assessment method frequently used in conservation biology. The SSC also requested that the Council ask NMFS to provide the data needed for the SSC to develop the PVA in parallel to the NMFS process. The Council meeting concludes tomorrow at the YWCA Fuller Hall, 1040 Richards St., Honolulu. For the agenda and background materials, including how to connect to the meeting via webex, go to www.wpcouncil.org/category/upcoming-council-and-advisory-body-meetings or contact the Council at info.wpcouncil@noaa.gov or (808) 522-8220.